This how to Draw worksheet of a fairy floating on a leaf in water is a free printable and drawing lesson that will help give the young artist some confidence and direction in drawing a nice fantasy scene. I first drew this as a printable coloring page and I thought it would make an interesting drawing lesson for a young artist. It is a simple project and ideal for the young artist or for extra drawing practice. Parents and teachers and Homeschool families will find many ways to use this project. You can use it in class. You can use it to help you draw an illustration or a page in a comic book. You can send it home as an extra project. You can use it as a lesson by itself. You can use it as an extra activity to fill in the time. Print a few like this and take them as a vacation activity for the kids. Learning to draw takes practice so do not give up if your project does not turn out the way you had hoped it would. Your frustration is a good sign and shows that you have talent and know how you want your picture to look like. You only need to get your skill up to the level of your talent. So draw every day and soon you will be making beautiful pictures. Come back to my blog often and try some of my other projects. To print the How To Draw Worksheet for A Butterfly Fairy Girl Floating on the Water below just highlight it and save it, then open a word doc, and past the image, then it should print. I didn't leave enough margins so you may need to choose the edge to edge printing if your printer offers that or adjust the margins on the word toolbar. If you have problems printing see the how to print tab above for some suggestions or try one of the updated links below. How to draw a butterfly fairy floating on a leaf worksheet and lesson. To see the larger version of this project as a coloring page for kids CLICK HERE. 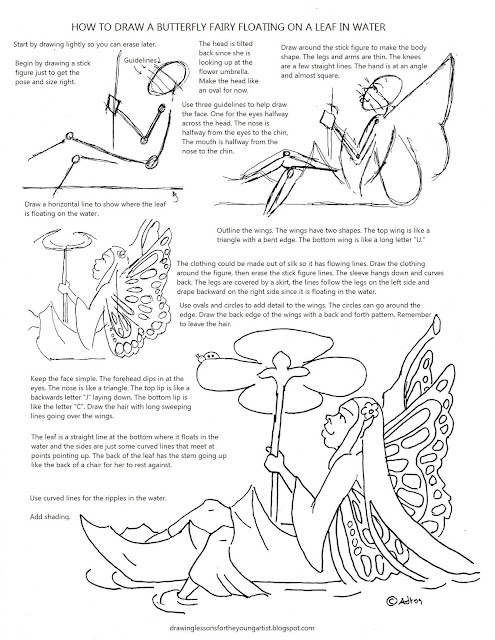 You might also like to try the How to Draw a Butterfly Fairy Kneeling. CLICK HERE. Here are two links that have been modified to print better. CLICK HERE for a file in photo ,JPEG, format. CLICK HERE for a file in portable universal format. PDF. Start by drawing lightly so you can erase later. Begin by drawing a stick figure just to get the pose and size right. The head is tilted back since she is looking up at the flower umbrella. Make the head like an oval for now. Use three guidelines to help draw the face. One for the eyes halfway across the head. The nose is halfway from the eyes to the chin, The mouth is halfway from the nose to the chin. Draw a horizontal line to show where the leaf is floating on the water. Outline the wings. The wings have two shapes. The top wing is like a triangle with a bent edge. The bottom wing is like a long letter "U." Draw around the stick figure to make the body shape. The legs and arms are thin. The knees are a few straight lines. The hand is at an angle and almost square. The clothing could be made out of silk so it has flowing lines. Draw the clothing around the figure, then erase the stick figure lines. The sleeve hangs down and curves back. The legs are covered by a skirt, the lines follow the legs on the left side and drape backward on the right side since it is floating in the water. Keep the face simple. The forehead dips in at the eyes. The nose is like a triangle. The top lip is like a backward-facing letter "J" laying down. The bottom lip is like the letter "C". Draw the hair with long sweeping lines going over the wings. Use ovals and circles to add detail to the wings. The circles can go around the edge. Draw the back edge of the wings with a back and forth pattern. Remember to leave the hair. The leaf is a straight line at the bottom where it floats in the water and the sides are just some curved lines that meet at points pointing up. The back of the leaf has the stem going up like the back of a chair for her to rest against. Use curved lines for the ripples in the water. These worksheets are free to print but your gift will help keep this blog going. Thank you for visiting my blog. I hope this project is fun and helpful for you. To find more like it use the searchbar above or see the labels below or choose one of the favorites in the sidebar. I am sure you will find one you like. Use the links below to share this post.